Click or touch a question in the list below and the answer will open up beneath. ​How long does it take to train a dog on your system? ​On average, our simple training protocol requires two 10 minute sessions a day per dog for approximately 10-14 days. Some dogs learn within just a few days. NO. When your dog walks past their new boundary, our systems deliver a mild correction that can be compared to the static electricity one feels when walking across a carpet in the winter. This mild correction your dog feels is designed to be undesirable so your dog will learn to avoid it, yet is totally harmless and humane. Our systems give the dog an audible alert BEFORE ​a correction is received. Your dog will quickly associate the audible alarm with impending discomfort, so he or she will soon understand where the boundaries are. In summary, the correction that your dog may occasionally receive will startle your dog but not hurt them in any way. It is our belief that any dog using our system and following our training protocol can be successfully trained to stay safely in their yard. The next dog that our system does not contain . . .will be our first. Of course, there are a few breeds or circumstances that may need special consideration. We will discuss your situation with you before we begin any installation. The fact remains, we have safely contained many previously considered "hard to contain" breeds like Huskies, Malamutes, Beagles, Border Collies, German Shepherds, Basset Hounds, Pit Bulls, Brittany Spaniels, etc. Are there any Hidden Costs with your system? No. The price you get from us is the final price . . . period! Pittsburgh Pet Fence uses Rechargeable collars that come with a limited lifetime warranty. This means you do not have to be burdened with buying and stocking expensive batteries to keep your collars running. Our competitors try to put you on a battery plan and can charge up to $69.95 per year per dog for batteries. That comes out to $840 over 12 Years or $1,050 over 15 years. For two dogs, the extra cost can go up to $2,100 extra just for batteries. That expense is just not necessary. Our competitors will also try to charge you extra for training, while we include training with our installation packages. Our collars are unique in that they have a status light that will blink green when your collar is charged and working properly. Most other systems being sold either have no light, or they have a "low-battery" light which only flashes for a few days when the collar is really low, then stops flashing when battery is completely drained (leaving you a 50-50 chance of the collar working if the light is not flashing). With our collars, you'll always know for sure when you see the green light blinking. The general rule of thumb in the industry is about 6 months of age however, we have had tremendous amounts of success introducing dogs as young as 3 - 4 months to our system. This can be discussed during the initial consultation to make sure we consider the specific circumstances to determine what is best for your dog. Is Pittsburgh Pet Fence the same as Invisible Fence®? Every week we get several calls from people asking us if we can give them a quote on an Invisible Fence® for their dog. We want to be clear, we are not an Invisible Fence® dealer. Invisible Fence® is a trademarked name that refers to a specific company and product. Pittsburgh Pet Fence sells electronic pet fencing equipment that uses similar technology to what is sold by Invisible Fence®, but we use products with more features and with a higher level of technology that can provide significant improvement and cost savings for the pet owner. We often times are called into situations in which dogs have proven to get through their systems but have been contained by ours. ​We often times say that they are much better at sales and marketing than us, but we are much better at containment than them. Call us and we can explain why and share with you documented cases that have proven this point. 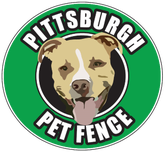 Does Pittsburgh Pet Fence service other systems like Invisible Fence® in the Pittsburgh area? Yes. We can service and repair ANY type of electronic pet fencing system in the Pittsburgh area. We can diagnose faulty transmitters, find and repair wire breaks, re-design, re-wire boundary lines and add additional loops (around gardens, etc). Does it make sense to switch to a Pittsburgh Pet Fence system if I already have an Invisible Fence® system? More than likely. Because Pittsburgh Pet Fence uses Rechargeable Collars that do not require a $69.95/year battery plan unlike our competitors use. And, because of our generous buy-back program, it actually makes sense to switch in most cases. The one-time cost for switching over is soon back in your pocket because you no longer have to buy expensive batteries. The more dogs you have, the more quickly this payback occurs. Often, in less than 3 or 4 years, you will be ahead of the game financially by letting us upgrade your system to a Pittsburgh Pet Fence system. In addition to the cost savings - you will get several other features that will be a step-up from what you currently have in place. If you are adding a new dog to your pack - the payback is almost immediate because of the high price that Invisible Fence® charges for a new collar. In this case, it is a "no-brainer" to switch from Invisible Fence® to a Pittsburgh Pet Fence. We are a local, independent dog containment company servicing the Greater Pittsburgh area. We service all brands of electronic pet fencing in the Greater Pittsburgh area, including Invisible Fence®. The most notable difference is that we use a rechargeable collar with a limited lifetime warranty which saves our customers a lot of money. This fact alone can save you $69.95 per dog per year ($840 for 12 years or $1,050 for 15 years). We are the only company to offer the patented "Run Through Prevention" feature. We believe we are the best installers in the area. We know this because we fix a lot of our competitors’ systems and we notice the inferior installations they do. We are called upon to fix a lot of different systems due to wire breaks, etc. It is rare we receive a call to fix our own as our installations are hardened to prevent commons wire breaks. There are other companies that sell similar systems, why should I choose Pittsburgh Pet Fence over the others? First of all, we are local. We happen to be the only Pet Fence installation company based in Allegheny County. Our competitors are based in either the state of Ohio, Mercer County, Butler County or Westmoreland County. So if you are looking to deal with a local Pittsburgh based company, you have found it. We also have the closest proximity to Washington County since as we are located in the South Hills of Pittsburgh. All the companies in our area share the same basic radio-based technology that was invented by Invisible Fence® many years ago. Each has a good and effective product and will help you keep your dog safe. We truly believe that each company operates with the well-being of your pet as their top priority and each of them has an effective product. We hope your final choice will be us . . . A company you can trust to offer the best overall value for keeping your pet safe and protected. So your choice comes down to finding a company that you trust and that offers you the best overall value. ​If you like dealing with a large corporation that has with many levels of bureaucracy, then we are probably not the right company for you. If a small local company with access to the actual owner is more your style, we may just be the company you have been looking to work with for your pet containment needs. But if you like dealing with a small local company and having access to the actual owner of the company, then we very well could be the right company for you. Do you offer some sort of Financing or Payment Plans? Yes, we offer Zero % 12-month financing via Dollar Bank. Pittsburgh Pet Fence refers its customers to the following quality lender for their financing. ​Click footer link below and enter Promo Code 0604-2706.